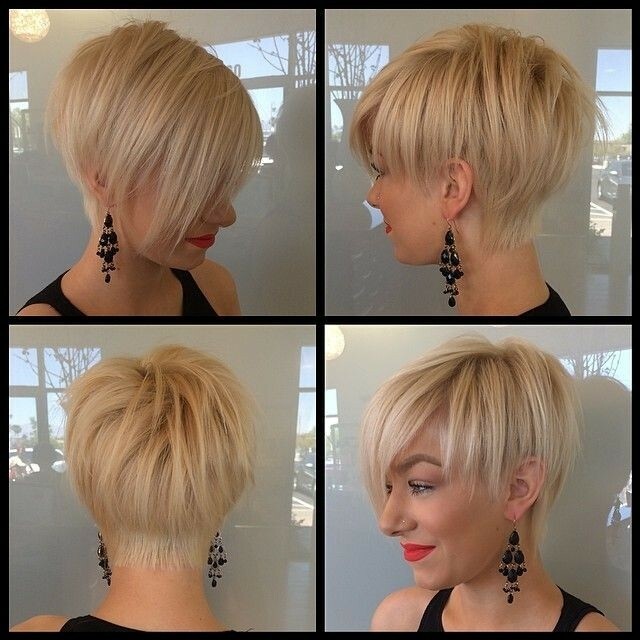 Fine, soft hair comes into its own when styled in a pixie cut! A layered pixie cut shows off the fluffy texture of silky-soft fine hair and makes it easy to get that volume you’ve always wanted. So if you want to avoid the familiar flopped look that plagues all of us who have straight, fine hair – here are some great ways to sport short pixie cuts for fine hair! 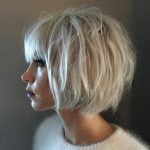 Simple everyday short haircut for women: Strictly speaking, white-gold blonde has taken over from platinum blonde this season. It’s a subtle difference, but white-gold is a slightly warmer and more flattering shade. 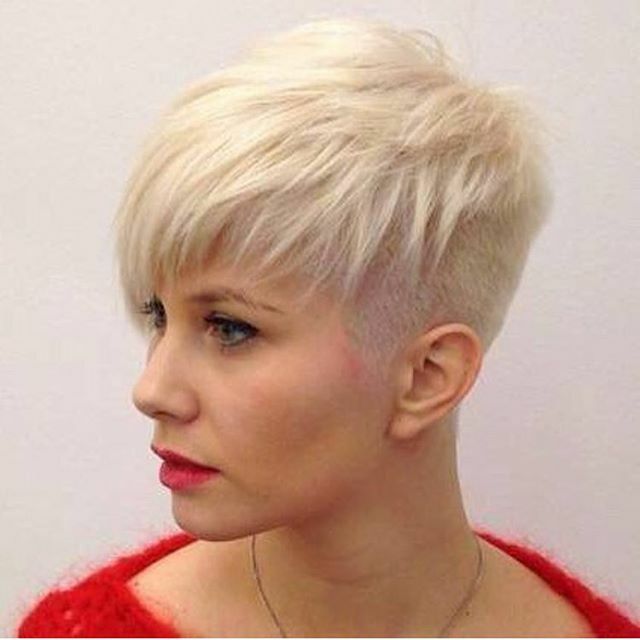 This high-fashion pixie cut borrows the trendy short-back-and-sides boy-cut and creates lots of interesting volume and texture in the longer hair on top. The fringe, which can be adjusted to flatter lots of different face shapes, covers the forehead in a shaggy diagonal line across the top of the face. In particular, the top volume, shaggy texture and buzzed sides with no side-burns create the perfect short hairstyle for a round face. 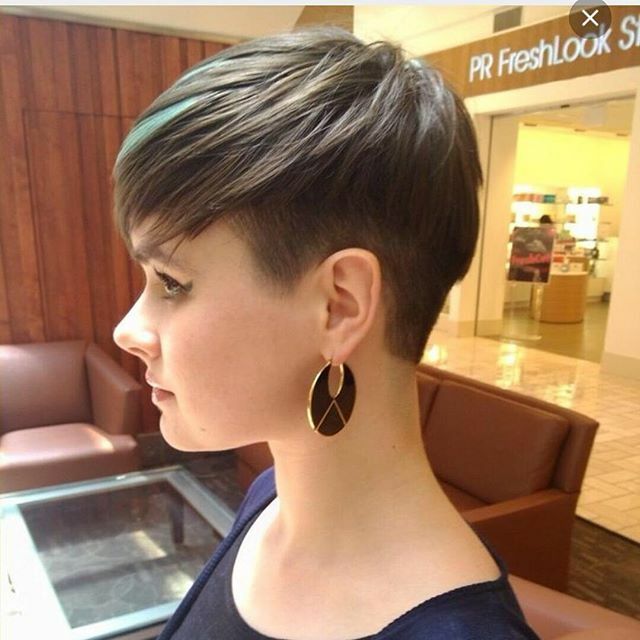 Feminine pixie cut: At the other extreme, here’s a more natural-looking pixie cut that copies the lines of an Eton crop, but with added layering to create more lift on top. This asymmetric pixie hairstyle is softer and with an off-centre parting, it suits the oval face shape of the model. However, moving the parting will allow your stylist to tailor the look to flatter a round or heart-shaped face. To flatter a long or thin face add waves or curls at the sides to add ‘width’. 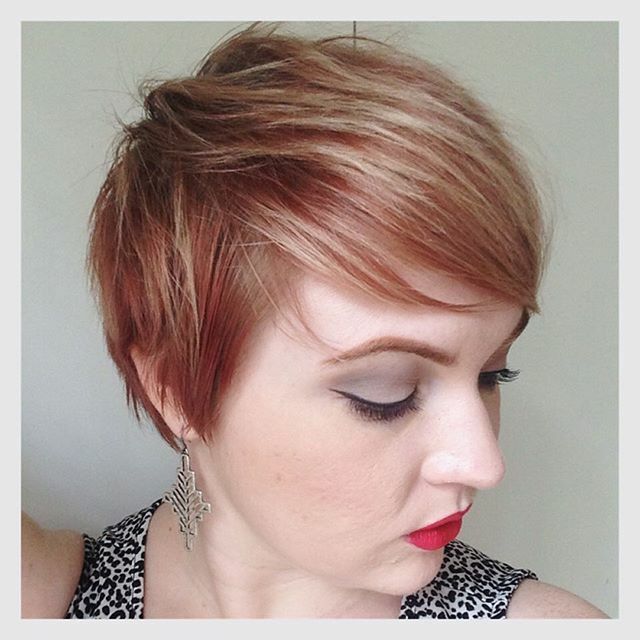 Best short haircut for women: The colour combination on this tousled pixie for fine hair is totally new! It has a light-copper-brown base which is a warm colour, broken up by a neutral blonde shade, which is a cool colour! This fresh colour idea works well on fine hair for two reasons. First of all, adding bleached highlights to healthy, fine hair is a great way to thicken the hair strands and create more body. Secondly, as both of the colours are light-tones, there isn’t too much of a contrast between them. Copper shades bring warmth to a pale complexion and this young woman is wearing an eye-brow pencil shade that matches her hair perfectly! There is something so attractive about the golden-blonde shades! 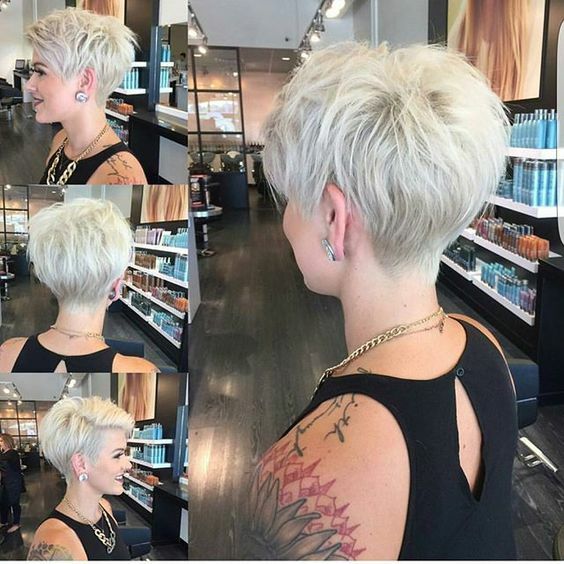 As well as flattering a wide range of skin tones, medium gold with white gold balayage is a great way to get texture and light reflexions on a pixie cut for fine hair. 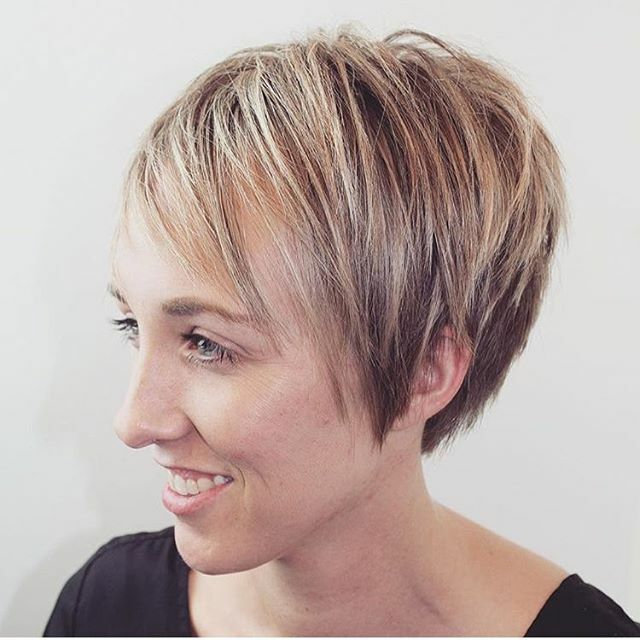 This swept-over short hairstyle has longer layers than some pixies for thin hair, but it works well as the lightening process makes fine hair denser and adds natural volume! 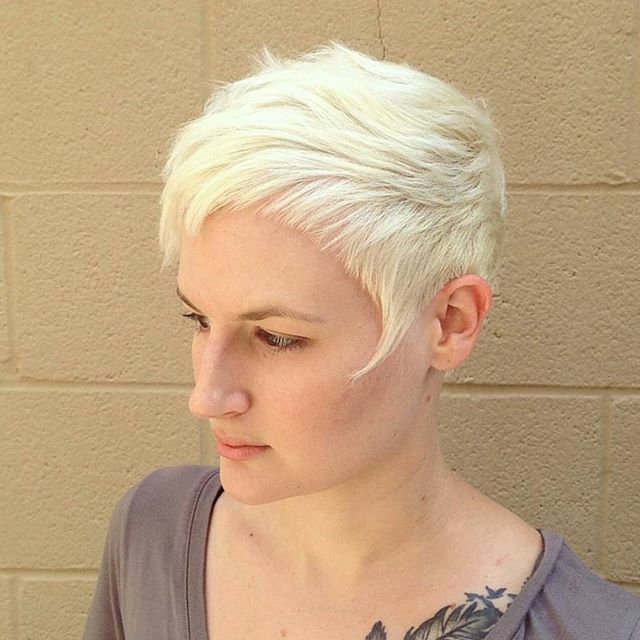 We love the wash and go aspect of this cute, short pixie for thin hair. The top is layered to make it easy to fluff up your hair and if you need extra body, just give it a spray with dry shampoo powder and leave overnight. I have fine hair and a very similar pixie cut to this, which I boost with Schwarzkopf’s Got2be Powderful volumising powder. It’s an absolute godsend to thin hair, because it really works. You only need a tiny bit of powder to keep your hair from going flat all day and all night! Notice the dual blonde highlights adding texture and depth in one of our favourite daily hairstyles for fine hair. This smart young woman’s fine, thin hair has been cleverly managed to create a totally chic look! With an all-over lightening treatment, the hair shafts are instantly thickened, so you can have long layers with sufficient natural body to look great! The back has a mini-stacked look to create a lovely, rounded shape with defined pointed strands adding volume and texture. The colour texture comes from using two very light shades of blonde and the result is a very sophisticated pixie hairstyle for (previously) thin hair! 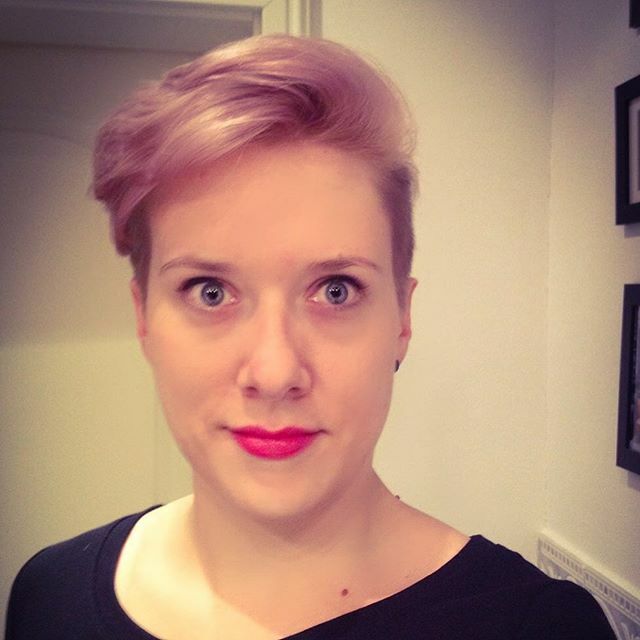 This silvery-blonde shade with blue/lavender tones is perfect to tone down a ruddy complexion! It’s another all-over lightening project, which will give any short, thin-hair style a huge volume boost. 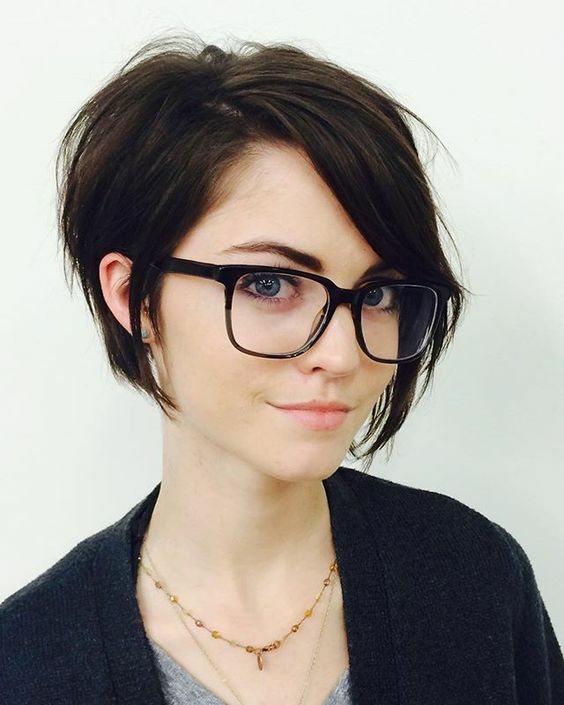 This cute pixie cut for fine hair, is also a short bob hairstyle, with a modern asymmetrical side parting and a swept-across ultra-long fringe. The back has a lightly stacked back, creating that beautiful rounded curve above the neck. And the sides sections have medium-textured tips to create an attractively sharp, slightly ragged finish when a little styling cream is applied. 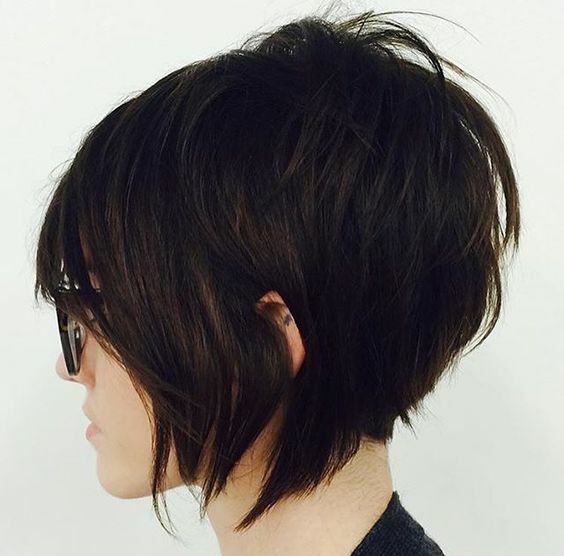 Latest popular short hairstyles for 2016: Looking for something special to display your avant-garde fashion style? This is the look for you! 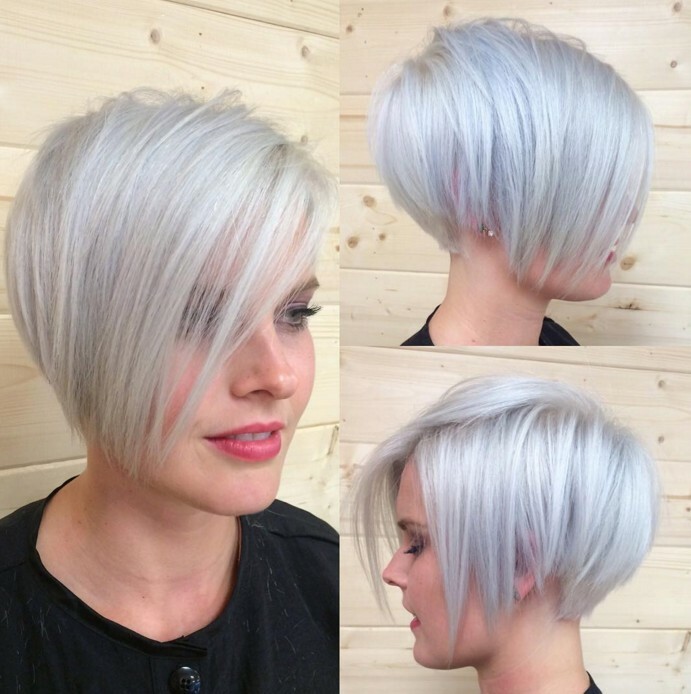 This soft-grey shade harmonises beautifully with the model’s pale, but warm complexion. 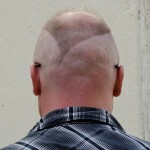 The sides are cut around the ear with long, straight side points. To emphasise the creativity of this look, the front has been lightened to a wheaty-blonde shade – adding a gentle, and wholly unexpected, contrast colour! Fine hair looks fabulous in this style, as the length on top can easily be styled for added volume and texture, whilst the silky-smooth fringe and back section drape beautifully in soft curves! 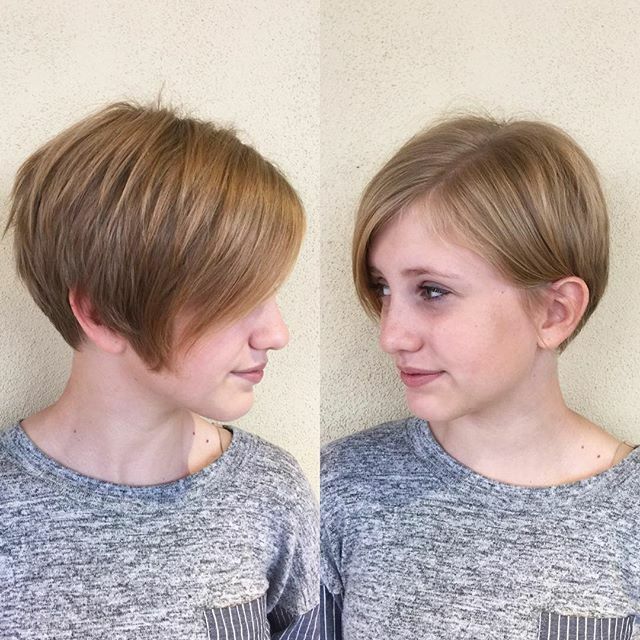 What you notice first about this cute pixie cut is the lovely texture and movement achieved in the model’s fine hair. Thin hair always looks thicker in a short hairstyle and the trendy, brushed-forward styles create volume more easily than hair combed in its natural direction. This stylish look can be worn as an everyday hairstyles option or for a special event! As an example of popular daily hairstyles, it has lots of interesting features, from the soft white-blonde shade to the short, curved half-forehead fringe. We love how it’s graduated down to a pretty curved side-point, framing the eyes and upper face. 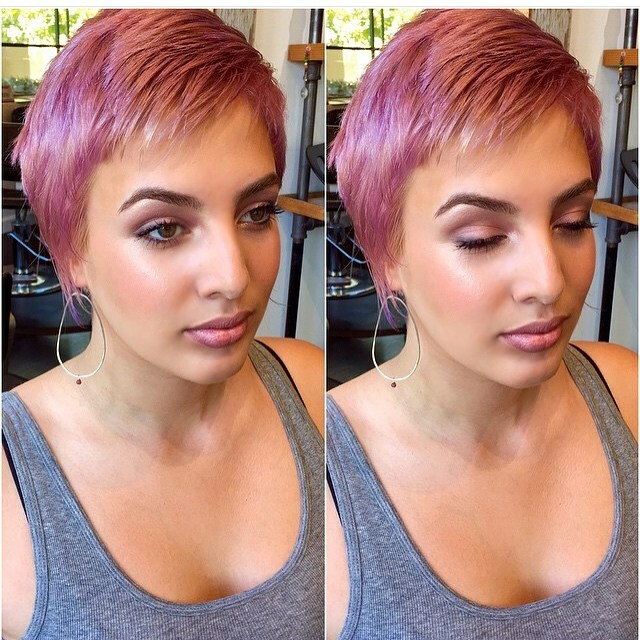 African American short pixie cut idea: I love this new shade of lavender-pink. It’s a fresh, high-fashion/party shade that looks super-cute on soft, fine hair in a short hairstyle. Pre-lightening fine hair adds body and the carefully layered top, graduated into adorably wispy tips at each side, creates the perfect shape to counteract a heavy jawline. The top has loads of attractive texture in the lightly textured tips and although the model has an oval face, the short side-swept fringe can be infinitely varied to flatter different face-shapes. 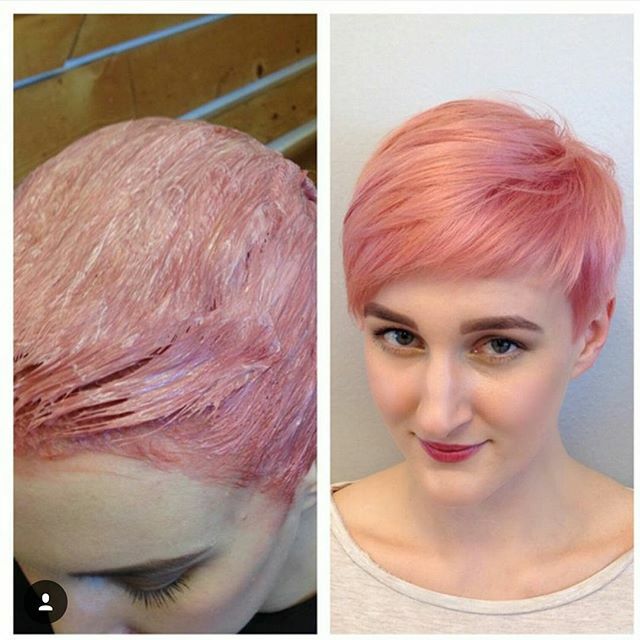 Hair color ideas for short pixie cut: This cute coral-pink pixie cut is suitable for heart, round and oval faces. The fringe disguises a broad forehead, the shortness of the fringe adds length to a round face and the height on top also adds flattering, facial ‘length’. Coral pink looks best against a warm skin tone, as there’s a touch of yellow-orange in the reflections that will harmonise with your skin’s golden tones. Soft colours help balance out heavy, straight eye-brows and draw attention away from a slightly larger-than-you’d-like nose. 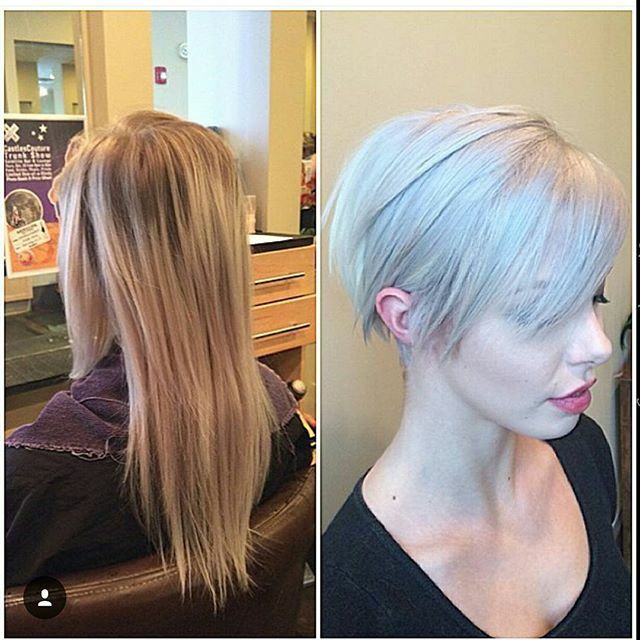 There’s a dramatic difference in this long to short pixie makeover! 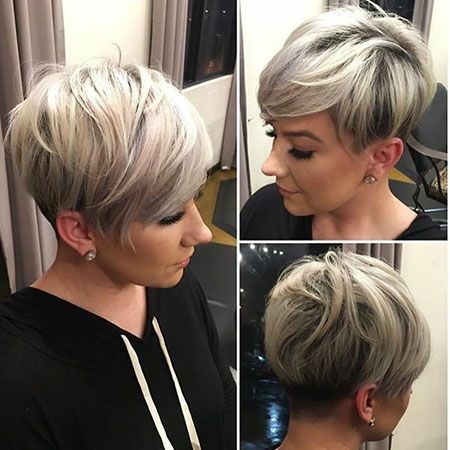 This really shows the power of contemporary, short hairstyles, because the model has a completely different image after losing the rather ‘ordinary’ long blonde hair and gaining an edgy platinum-blue-blonde pixie! With the hair lightened all over, you get coarser hair strands that can be worn in long layers without looking thin. 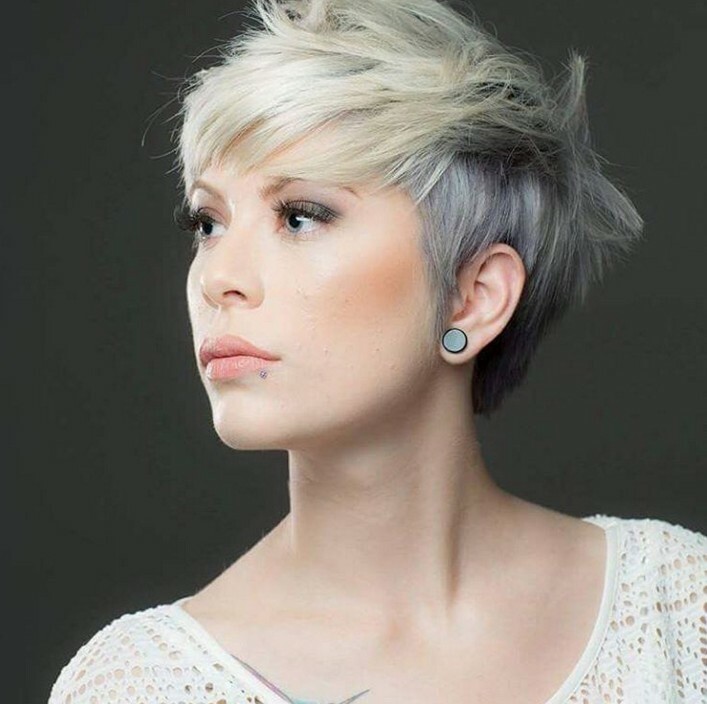 Hair can be cut with sharply textured tips, like this high-fashion look, confirming that asymmetrical short hairstyles for fine hair pack a huge style punch! Hairstyles for fine hair that’s also a dirty-blonde, mousey-brown shade benefit from blonde highlights. However, that doesn’t have to mean anything harsh, as you can see from the flattering short hairstyle for thin hair below. Neutral or wheat-blonde streaks in the top layer, with the underlayer left its natural shade, mimics the effect of summer sunshine. This also creates 3-D colour-depth and texture, making your hair appear thicker than it actually is! This long, beautifully- layered pixie with textured tips is perfect as a chic everyday hairstyles option or with a floral decoration, for a special occasion. Short pixie haircut for women over 50: Everyday hairstyles for short fine hair are very easy to maintain, like this pixie with a softly swept-over top. Short hairstyles can be every bit as cute and feminine as long hair and are often a lot more face-flattering, when expertly tailored to your individual face-shape! This example of easy daily hairstyles is also one of the best possible pixie haircuts for a round face. Showing the forehead and adding height on top makes a dramatic difference on a round face. Flat sides also slim down a wide face and the little lock of hair pulled down over one corner of the brow, softens the line beautifully! If you love the healthy natural look of your hair and aren’t keen to undertake the cost and time required to maintain blonde highlights, try this quirky idea! A few strands of hair have been bleached and then tinted a pale aqua shade to give a genuinely fresh look! The look is no-nonsense French chic, with short-clipped, blunt side-burns and a shaved, straight-across outline above the nape. And my best advice to get more volume and texture into your hairstyles for fine/thin hair is this: switch to short, layered pixie haircuts, use Schwarzkopf’s Got2Be volumizing powder, or spray-in dry shampoo. Consider going lighter with blonde streaks, or if you’re a brunette add coppery highlights! And you’ll love wearing these cute pixie cuts for fine hair as compliment-gathering daily hairstyles! 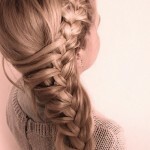 Find more latest right hairsttyles for you on hairstylesweekly.com!